I’m a blogger and work from home full-time. I love that I have the ability to stay home and take care of my daughter, but their is one major drawback of not going out to work each day. My waistline can literally expand weekly if I don’t monitor what I eat! To combat munching and overeating I have started blending my food. I start each day with a healthy smoothie and some weeks I even go on blended food diets to lose weight. That’s why I’m a fan of nutritionist guru and celebrity trainer Harley Pasternak. The New York Times bestseller has worked with some of the top celebrities while also appearing on major shows like The Today Show, The View, Dr Oz and Oprah Winfrey to help teach individuals how to shed pounds without sacrificing health or connivence. Pasternak believes the blender is the most under appreciated gadget in the kitchen. To help make blending easier at home Pasternak recently partnered with Salton to create the Power Blender, a professional grade blender at a friendly price. The 8 Japanese blades blending system (4 sawtooth + 4 ultra sharp) is equipped with 1500 Watt torque, 30,0000 RPM and a 2.0 Horse power motor. Believe me when I say this blender is incredibly powerful! It easily blends whole fruits and vegetables for smoothies, dips and soups while emulsifying the ingredients to preserve their enzymes and other healthy nutrients. The blender can also mill rice into rice flour, mix nuts into tasty nut butters and crush ice into snow for snow cones in seconds. One problem I have had with blenders I have owned in the past is that they never never completely blend the ingredients to the same consistency. The many reason for this is because non-professional blenders only run on 75o Watts. I haven’t had that problem with the Harley Pasternak Power Blender. The motor is so powerful it can blend frozen fruit almost into a mousse on the highest setting! Also, if I want more chunks I can lower the speed setting. One of my biggest pet peeves about everyday blenders is that they tend to be really difficult to clean because the base around the blades is really small. With the Power Blender this is not a problem because the base has been made bigger to allow a sponge to easily get to the bottom and to clean the blades much better. Cleaning up with Power Blend takes half the time as others and the parts can even be put in the dishwasher. Blending is truly more convenient than ever! Ready to try a new recipe? One of my favorite recipes to create with the Harley Pasternak Power Blender is my Pregnancy Raspberry Smoothie. I first recommended this smoothie to mom-to-be’s because smoothies can actually reduce morning sickness and provide essential vitamins. Don’t worry though, this delicious drink can be enjoyed by all smoothie loving people! 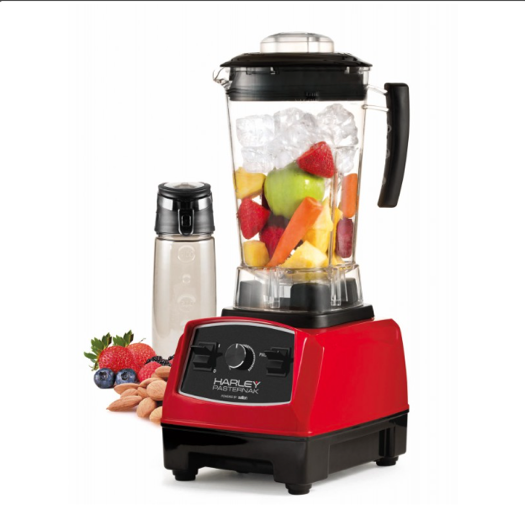 The Harley Pasternak Power Blender comes with a five year warranty and retails for $249.00 at Salton. It is also available for retail purchase at Bed Bath & Beyond, Best Buy, Canadian Tire, Home Hardware and the Linen Chest. Visit Salton to learn more about the Harley Pasternak Power Blender. Be sure to follow Salton on Facebook to keep up with their latest products. Disclaimer: Celeb Baby Laundry has not received any payment as a result of this feature. We were sent the product for the purposes of review. All opinions are our own.